First of all, let’s partake in a little Salad 101. 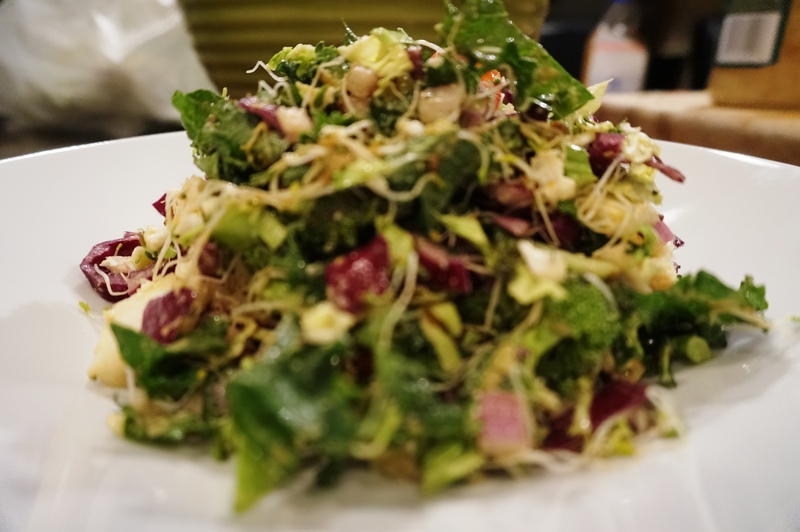 Salad with your meal is a great way to bring more mineral-rich, alkaline-forming greens into your diet, pack in the fiber, and prepare your digestive system to break down and assimilate the coming nutrients by providing living, active enzymes. Enzymes are catalysts of biochemical reactions in our bodies, and perform thousands of life-supporting functions, including: helping repair DNA, contributing to smooth and radiant skin, and helping to speed up detoxification and weight loss. Ahem. The huge enzyme reserve that we are born with diminishes with age. And so, as you get older, you want to ensure you have the best supply of vital enzymes at hand. You can do this by eating some raw plant foods everyday. This is what we call ‘live’ food. That’s why having your salad (or at least a good few bites) before you dig into your meal is the way to go. Really, noshing on any raw veggies as you make your cooked meal will help you to digest the rest of your meal. Back to the salad rut. Consider changing things up from the boring green lettuce, celery and tomato routine. I whipped this one up in a matter of minutes the other evening. Finely dice the following: kale (stems removed), cauliflower, broccoli, red cabbage, red onion, mushrooms. 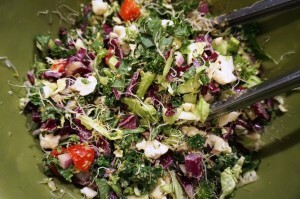 Add halved cherry tomatoes and a big handful of alfalfa sprouts. Dressing: in small bowl, whisk together – 1-2 tbsp raw tahini, 1-2 tbsp fresh lemon juice, 1 tbsp nutritional yeast, splash of tamari, 1 crushed garlic clove, Himalayan sea salt/freshly-cracked pepper. Add dribble of water to get to a consistency that works for you. Play around with the ingredients until you are satisfied with the taste and add to salad. Sprinkle generously with hemp hearts or sesame seeds.